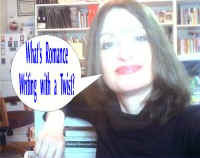 ROMANCE WRITING WITH A TWIST? Unique. Innovative. Original. Unpredictable. Out-of-the-Ordinary. All of the above words have been used to describe my books. In fact, the title of an interview in my local paper states: Out-of-the-ordinary just right for author. Okay, I admit it, I do like things unusual... deliciously different... with a bit of a twist. And my writing reflects this. I love to run the gamut by exploring the outer reaches of the galaxy... to savoring the subtle nuances of Regency society. Here are just a few reviewer comments on my Romance Writing with a Twist . [LUCKY 13] The endings have a twist where the reader often things hmmm for a moment." --Romance At Heart. Listed below in alphabetical order are my books, each with its own twist! ALIEN HEAT published by Wings ePress, Inc. ISBN: 1-59088-695-X. This futuristic science fiction romance in print and ebook involves a cataclysmic crash of a meteorite, a "mutant witch", a handsome warrior, and heat-producing plants intent on turning Earth into another Venus. Now what could be weirder than that?! Click here for more information, reviews, and an excerpt. THE BLOODSTAINED BISTRO published by Desert Breeze Publishing. ISBN: 978-1-936000-57-1. This murder romantic suspense is the first case in the Minx Tobin Mystery Series. Eating at Valentin's bistro can be hazardous to amateur detective Minx Tobin's health, so why does she continue to dine at this restaurant? Click here for more information, reviews, and an excerpt. COMPETITORS! published by Awe-Struck eBooks, Inc. ISBN: 978-1-58749-615-8. This paranormal romantic suspense in print and ebook deals with the mystery of Humankind's "cousins"-- Neanderthals. Are they extinct, or are they... well, find out for yourself in COMPETITORS! 2007 Dream Realm Award Finalist for Best Speculative Fiction Romance! Click here for more information, reviews, and an excerpt. THE COMING published by Awe-Struck eBooks, Inc. ISBN: 1-58749-460-4. This 5 star paranormal romantic suspense is in print and ebook. The twist here deals with logical Larissa falling in love with her grandfather's best friend from World War II. How is that possible, you ask? It's easy--this "time-travel" is courtesy of the Bermuda Triangle! 2004 Dream Realm WINNER for Best Speculative Fiction Romance! Click here for more information, reviews, and an excerpt. 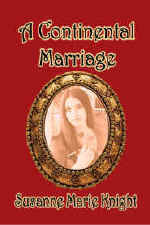 A CONTINENTAL MARRIAGE published by Wings ePress, Inc. ISBN: 978-1-59705-882-7. This Regency romance, in print and ebook, is concerned with the age-old question: for love or money? A handsome lord proposes, and an impoverished woman accepts... only because her grandfather's money sweetens the deal. Where does love fit into this transaction? 2007 Golden Wings Award WINNER! Click here for more information, reviews, and an excerpt. THE CONTRARY CONTESSA published by Awe-Struck eBooks, Inc in print and ebook. ISBN: 1-58749-468-X. In this 5 hearts Regency romance, a very proper and toplofty aristocrat finds himself in love with a woman who, not only is an outsider from Sicily, but she's also his stepsister! 2005 EPPIE Finalist for Best Historical Romance! Click here for more information, reviews, and an excerpt. FOREVVER to be published by Amazon.com. This science fiction romance, is the prequel to the books in the JANUS series: JANUS IS A TWO-HEADED GOD and JANUS IS A TWO-FACED MOON. What if eternal youth could be found not in a fountain, but in a box? What if the richest man in the world was also the oldest? Click here for more information, reviews, and an excerpt. Click here to order in print. GRAVE FUTURE published by Awe-Struck eBooks, Inc. This best-selling paranormal romantic suspense, in ebook, features a Shakespeare-quoting ghost intent on revenging his death. Drugs, graveyards, and an eerie fireplace all play a part as innocent Jocelyn gropes her way in the dark with a hostile federal agent investigating his cousin's murder. Click here for more information, reviews, and an excerpt. Click here to order in print. HAVE CHRISTMAS CARD WILL TRAVEL published by Uncial Press. 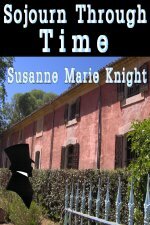 This time-travel Regency romance, in ebook, provides a modern young woman with a dilemma. How can she find happiness when she has one foot in the past with the other in the present? 2008 EPPIE Finalist for Best Historical Romance! Click here for more information, reviews, and an excerpt. Click here to order in print. 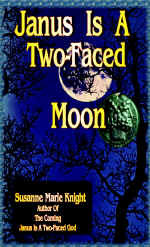 JANUS IS A TWO-FACED MOON published by Awe-Struck eBooks, Inc. This science fiction romance, in print and ebook, is a follow-up book to the award-winning JANUS IS A TWO-HEADED GOD in the JANUS series. This book poses a delicate question. An injured ballet dancer has a choice: her family or her world? Will she be Earth's savior or will she cause Earth's destruction? Click here for more information, reviews, and an excerpt. JANUS IS A TWO-HEADED GOD published by Awe-Struck eBooks, Inc. ISBN: 1-58749-196-6. This award-winning science fiction romance in print and ebook explores wormholes, supernovas, and alien traitors on one hand, while also pitting a young woman from Earth with a galactic leader who despises everything connected with the "old" planet. Voted 2002 Preditors & Editors Best Science Fiction Novel, 2003 EPPIE finalist, and 2002 Golden Rose Nominee: Best SF/Fantasy! Click here for more information, reviews, and an excerpt. LORD DARVER'S MATCH published by Amazon.com. In this 5-Star time-travel Regency romance in print and ebook, a modern woman makes an innocent wish for a happy marriage and lands back in time in a devilishly handsome nobleman's bed. Did wishing on a Celtic moon cause her trip to the past or should she just blame indigestion?? 2002 Golden Rose Nominee: Best Regency. Click here for more information, reviews, and an excerpt. LOVE AT THE TOP published by Awe-Struck eBooks, Inc. This contemporary romance, in ebook, is a different take on the Cinderella fairytale. A man-shy working girl finds the guy of her dreams only to learn that he's her new, arrogant, and filthy-rich boss. An evil socialite and a hip gum-chewing girlfriend complete the story. 2003 EPPIE Finalist for Best Contemporary Romance! Click here for more information, reviews, and an excerpt. Click here to order in print. LUCKY 13 published by Fictionwise.com. This anthology, in ebook, contains thirteen delightful stories, all by Susanne Marie Knight. Look for: Homesick, Lady Elizabeth's Excellent Adventure, Adolescence, Special of the Week, Friday Night, Happy Anniversary, Saturation Point, A Very Special Christmas Present, Zeus and the Single Teacher, True Love and Candy Corn, Shades of Old Glory, Teacher's Pet, and Grand-Mere's Sainte Bleu. Click here for more information and reviews. Click here to order in print. THE MAGIC TOKEN published by Uncial Press. This Regency romance in print and ebook weaves polite society fun with magic. After receiving a golden coin, sensible Amanda suddenly becomes governess to the young sister of a duke. Is her good fortune coincidence... or is the silly spell that she cast many years ago finally starting to work? 2003 EPPIE Finalist for Best Historical Romance! Click here for more information, reviews, and an excerpt. PAGING MISS GALLOWAY published by Awe-Struck Publishing. Edward Sterling, the new Earl of Trelaine is suddenly in need of a wife. So why do his thoughts of marital bliss drift toward his obviously inappropriate male page, Danny August? Or is Danny really an appropriate choice? And what about Miss Galloway?? 2008 Awe-Struck Regency WINNER! Click here for more information and reviews. PAST INDISCRETIONS published by Awe-Struck eBooks, Inc. ISBN: 1-58749-390-X. Hold onto your socks!! This paranormal romantic suspense in print and ebook deals with past lives, human cloning, the lost continent of Atlantis, and the birth of Greek and Egyptian civilizations. Also covered are a grandmother's wisdom, home-fried chicken, and small town life. After reading PAST INDISCRETIONS, you'll think twice the next time YOU have a recurring dream-- guaranteed!! Click here for more information, reviews, and an excerpt. 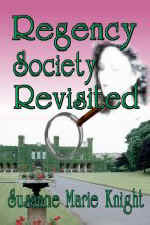 REGENCY SOCIETY REVISITED published by Awe-Struck eBooks, Inc. In this time-travel Regency romance, the future and the past collide! Anthropologist Serenity Steele has a job to do--to travel back to the past and study Regency society as a research project. She doesn't, however, count on the many attractions of a certain Regency rake. What is she going to do when her assignment is over? Click here for more information, reviews, and an excerpt. THE RELUCTANT LANDLORD published by Wings ePress, Inc. ISBN: 1-59088-121-4. This Regency romance, in print and ebook, involves a brooding earl who plans to install his mistress at his newly-won lodging and an impoverished young woman with an unusual occupation who wants to live there instead. The earl's transformation from cynic to lover is a very interesting journey. Also included is a surprise development that even I didn't know would happen when I was writing the story! Click here for more information, reviews, and an excerpt. SOJOURN THROUGH TIME, Awe-Struck eBooks, Inc. This time travel Regency romance, in print and ebook, drops an unexpected "package" (Alexandra Stanford) on an almost-betrothed duke's estate. What is the Duke of Milcaster, Malcolm Prescott to make of his oddly-dressed find? Click here for more information, reviews, and an excerpt. Click here to order in print. TAINTED TEA FOR TWO published by Uncial Press. This best-selling murder mystery romantic suspense, in ebook, includes a twist of humor. Who ever heard of a potato as a method of execution? While in England, a personal fitness trainer finds romance... and murder. Can she prove her innocence before the killer strikes again? 2008 ARIANA Award WINNER! Click here for more information, reviews, and an excerpt. Click here to order in print. TIMELESS DECEPTION published by Awe-Struck eBooks, Inc. This 5-Star time-travel Regency romance, in ebook, has thoroughly- modern Alaina switching places against her will with the cruel Countess of Saybrooke in the year 1818. This creates the interesting conflict of Alaina now being in love with her "husband" while he absolutely *does not* return the affection. How will she convince him she's cut from a different cloth than his unfaithful wife Alicia? 2002 PEARL Nominee: Best Time Travel! Click here for more information, reviews, and an excerpt. Click here to order in print. THE WAKEFIELD DISTURBANCE published by Uncial Press. In this paranormal romantic suspense, in ebook, Lara Wakefield has a gift, but thinks of her connection with the dead as a curse. Can Lara help a murdered young girl find peace... and stop the killer from sending her over to the other side? 2008 Dream Realm Award Finalist for Best Speculative Fiction Romance! Click here for more information, reviews, and an excerpt. Click here to order in print. I hope these brief examples of Romance Writing with a Twist have whet your appetite. :)) Please feel free to explore my website for more information. If you've enjoyed your visit, I'd love to hear from you. Just click here to email me and let me know if you'd like to sign up for my free e-newsletter, KNIGHT DREAMS! To order autographed print copies of Susanne Marie Knight's books, click here.  Like this site? Recommend it to a friend!